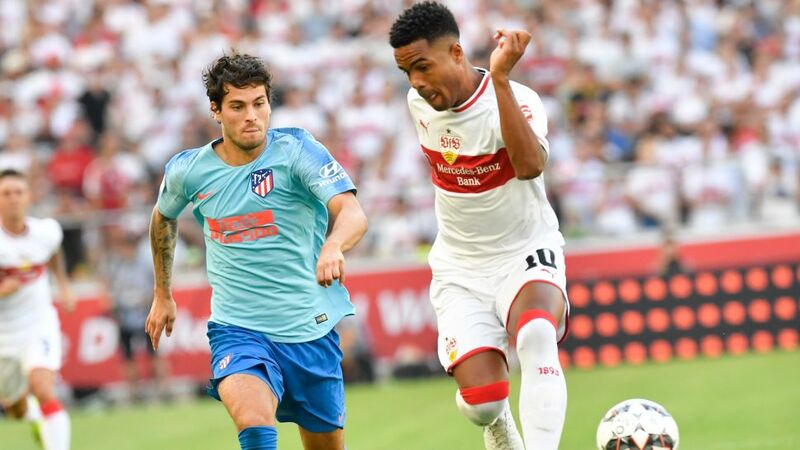 VfB Stuttgart's excellent pre-season form continued on Sunday with a 1-1 draw at home to Atletico Madrid in a friendly to honour the Swabians' 125th anniversary. The match was an entertaining one right from the get-go, with a promising early chance for Nico Gonzalez inside the first minute, but he couldn't quite apply a finish to Erik Thommy's inviting cross. Mario Gomez, who announced his retirement from international duty just before kick-off, was a probing presence throughout the first half as Stuttgart held their own against the Spanish giants, whose best opportunity fell to World Cup winner Thomas Lemar, but the Frenchman saw his effort bounce back off the post. The end-to-end nature of the encounter continued after the break and Tayfun Korkut's men edged ahead in the 58th minute when summer signing Daniel Didavi coolly finished from the penalty spot after he was brought down by Francisco Montero. The home team's lead was short lived, however, as Joaquin Munoz equalised almost immediately with a superb strike from the edge of the box. Stuttgart had a chance to restore their advantage when they were awarded another penalty, but Thommy smashed his effort against the crossbar. A series of substitutions on both sides disrupted the flow of the game in the closing stages, but on the whole Korkut will be happy with his team's performance in going a seventh pre-season match unbeaten. This was the first-ever meeting between these teams.Stuttgart defender Benjamin Pavard has three French colleagues in the Atletico camp with whom he won the World Cup over the summer: Antoine Griezmann, Luca Hernandez and Lemar.VfB midfielder Santiago Ascacibar played alongside Atletico's Angel Correa for Argentina at the 2016 Olympic Games in Rio. Diego Simeone's son Giovanni was also part of that squad. New Stuttgart signing Pablo Maffeo played faced Atletico twice last season while on loan at Girona, playing the full 90 minutes in a 2-2 draw last August, but was an unused substitute in a 1-1 stalemate in January this year.Stuttgart only conceded 10 goals in 14 Bundesliga games under Korkut last season; Atletico shipped 13 in their final 14 league outings.